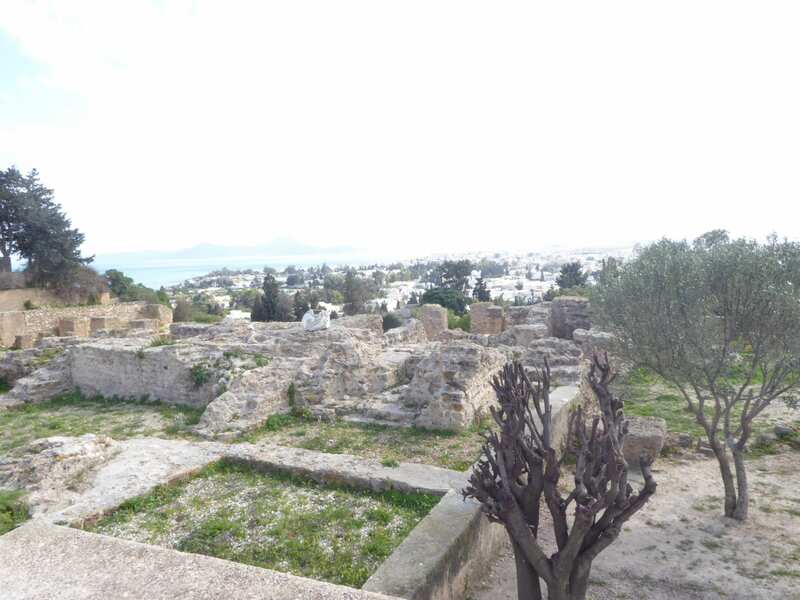 Home » architecture » Comments » cookery » Countries » Crafts » customs » Featured Articles » History » museums » tours » Travel » Return to Tunisia Part 3; Den Den, the Medina & Carthage. 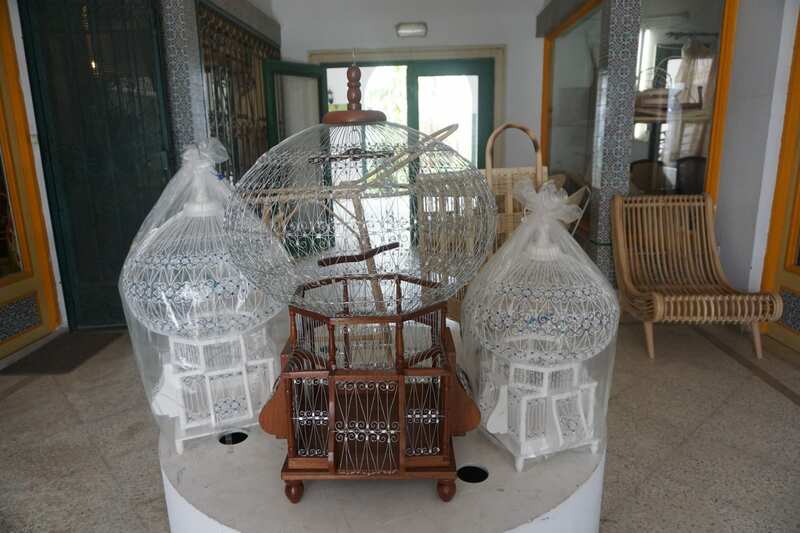 Den Den is a Handicrafts Village, not far from Bardo, and it has 45 shops, all making genuine Tunisian handicrafts. It’s off the usual tourist trail, but well worth a few hours’ visit. 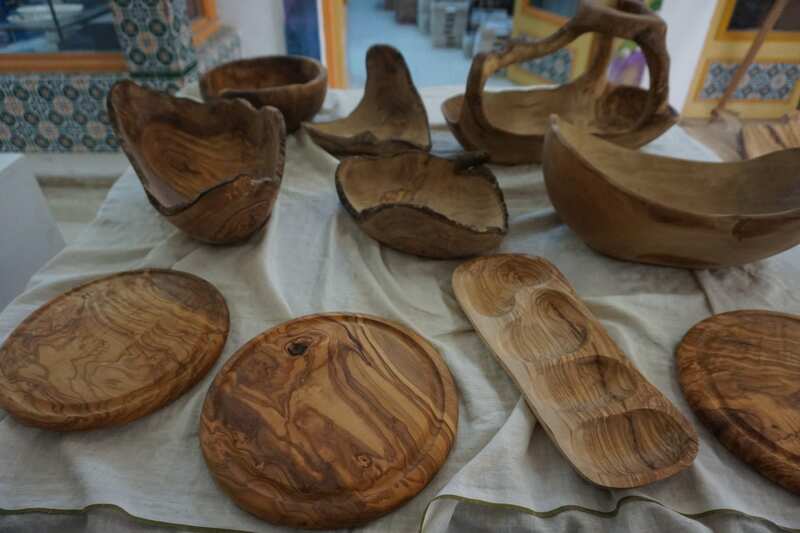 I was concerned as there was nobody there but us, then I found out that a lot of the craft workers enjoy working in those peaceful surroundings and they sell their work elsewhere, including exporting it to America and other countries. 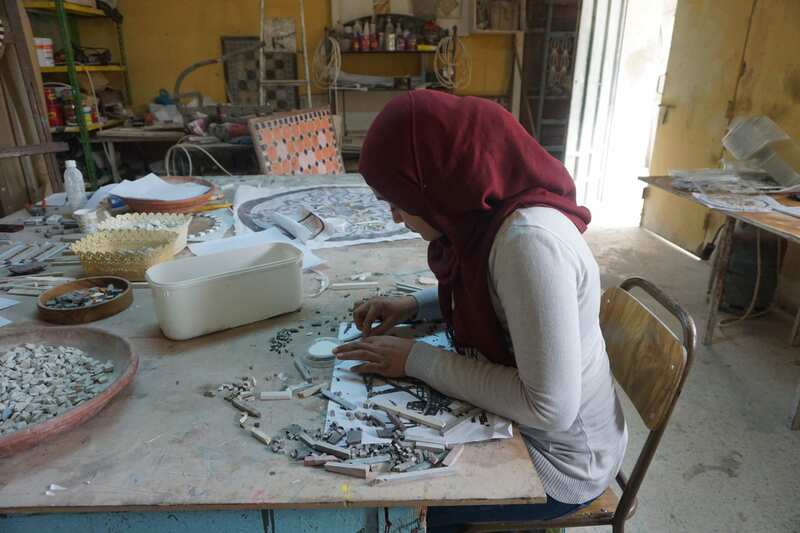 There are around 350,000 craft workers in Tunisia, and 85% of them are women. Everything you see has to be made in Den Den, not bought, and the women enjoy having their own income. 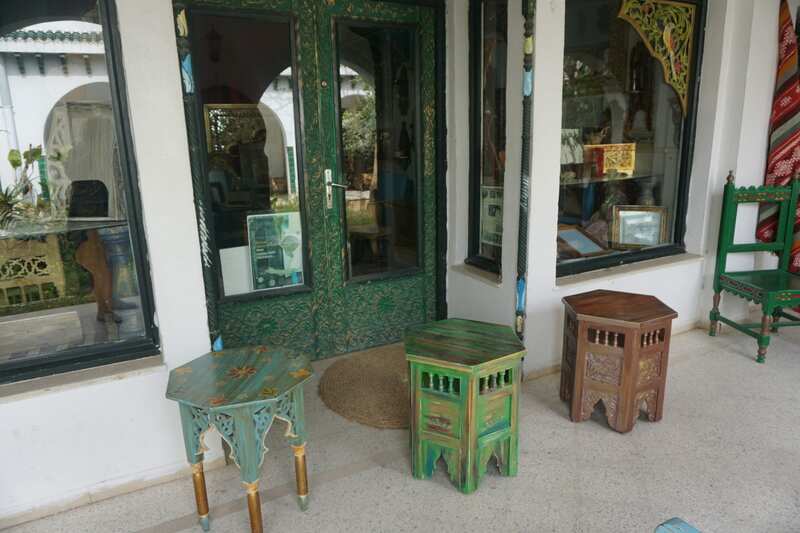 We wandered around and saw a great variation of work being made, including furniture, carpets, jewellery, glassware, traditional Tunisian birdcages, clothes, shoes, pottery and mosaics. My favourite was micro mosaic. The intricate work was amazing. 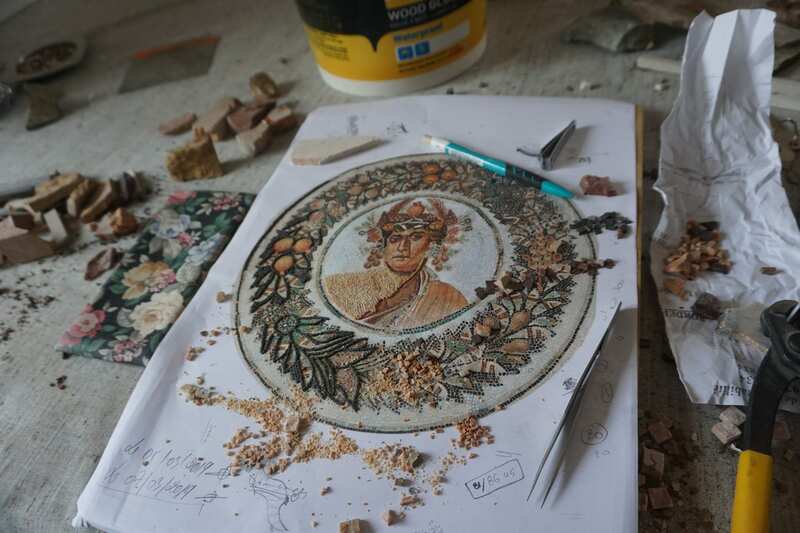 It took a long time to cut the pieces of mosaic and carefully stick them into a pattern. Nobody harassed us. They smiled a greeting and proudly showed us what they were doing, then they carried on with their work. I could have stayed there a lot longer, but we had to continue on our Journey. 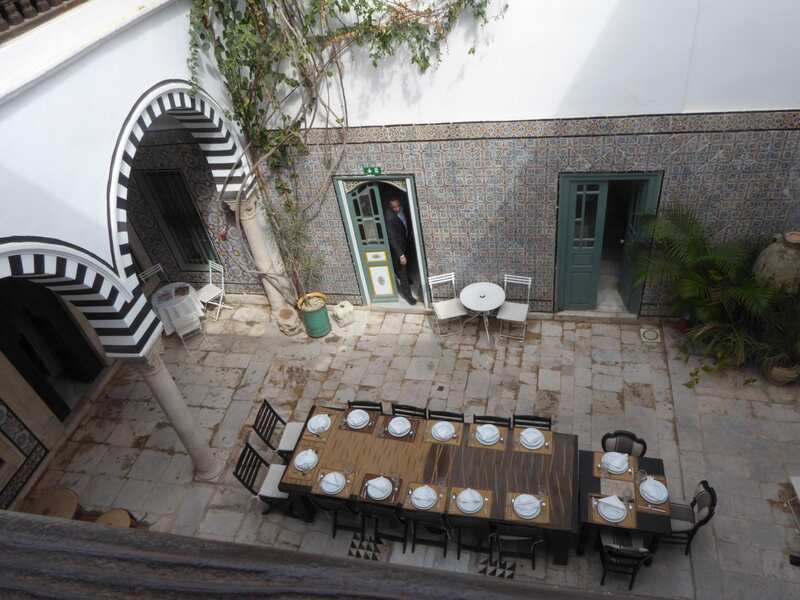 We went to the Medina of Tunis for lunch. The Medina of Tunis is the Medina quarter of Tunis, capital of Tunisia. It has been a UNESCO World Heritage Site since 1979. 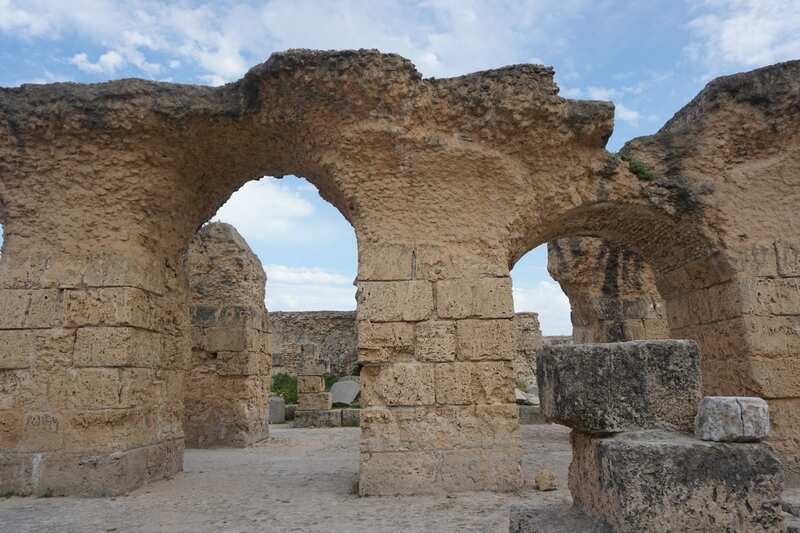 The Medina contains some 700 monuments, including palaces, mosques, mausoleums, madrasas and fountains dating from the Almohad and the Hafsid periods. It was very busy, but with local people hurrying around, not tourists. 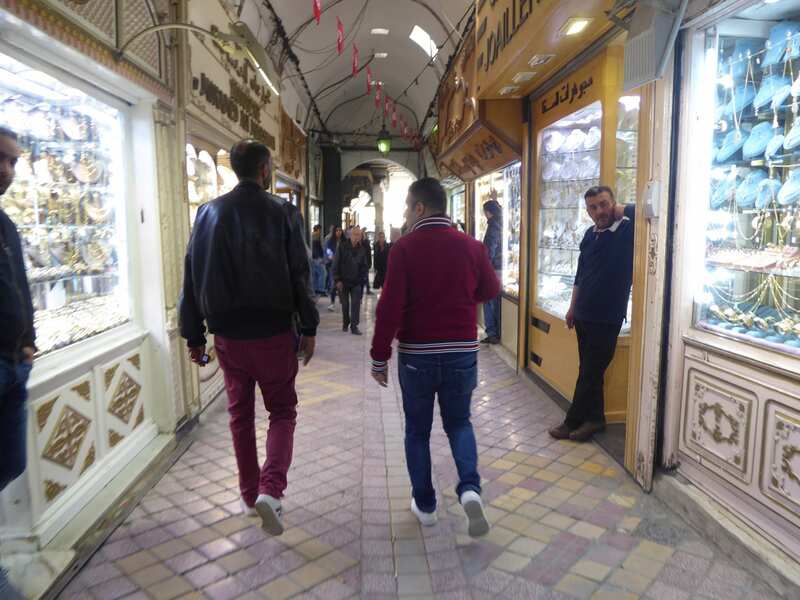 We were expected at the Dar Ben Gacem Hotel, but it wasn’t easy to find it in the narrow, winding streets of the souk. To my surprise, unlike the usual souks, almost all the shops were selling jewellery. Windows were clean despite the dusty streets and the jewellery gleamed. But there were no customers! 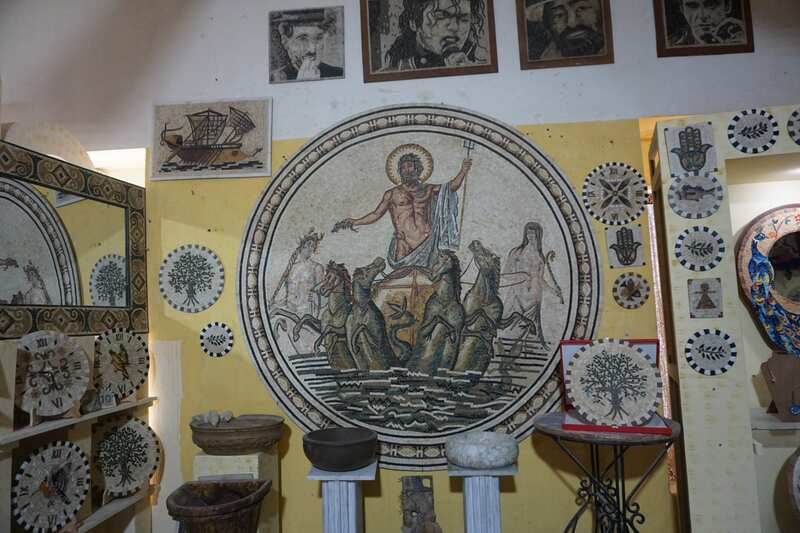 It was obvious we were visitors, but we weren’t approached or hassled to buy at all. Maybe they make their money from weddings and festivals. 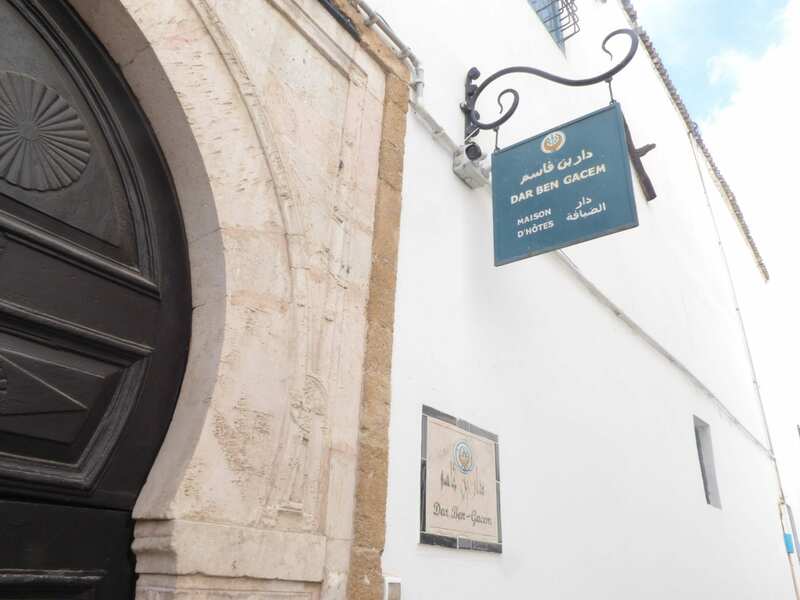 Finally after asking directions several times, we found the door of the Dar Ben Gacem and knocked loudly. The door opened almost at once and we stepped into a hallway. At the end it curved right and opened up into a courtyard in the middle of the building. The owner, Leila Ben Gacem, was there to greet us. She explained about the house. 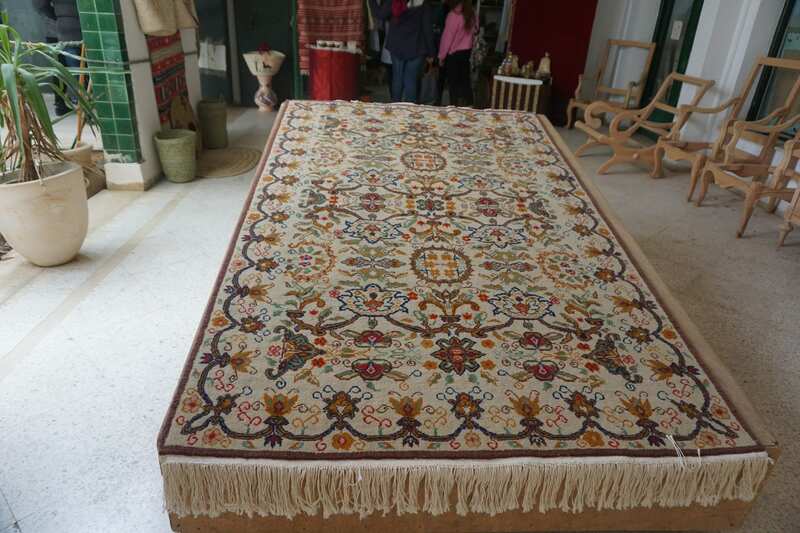 Leila bought it in 2006 from the Anoum family who had owned it for over 300 years. They’d bought it from another family, so the building has only had three owners! 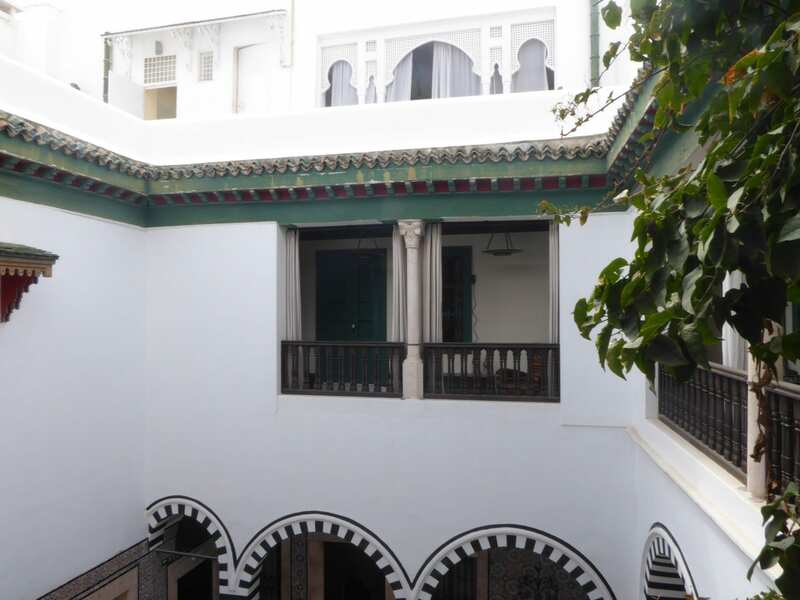 It’s a traditional Medina house. The front door opens onto the long hallway which curves, so nobody can see into the house when the door’s open. There are no windows on the outside of the house. All the windows face into the courtyard. When a son got married, he was given one of the rooms for his family, and when a daughter got married, she would go to live with her in-laws. Leila gave us a tour of the house. There are seven bedrooms, all architecturally preserved. The house is much bigger and more compact than it first looks. It’s all on different layers with walkways and hidden alcoves where visitors can sit in privacy. 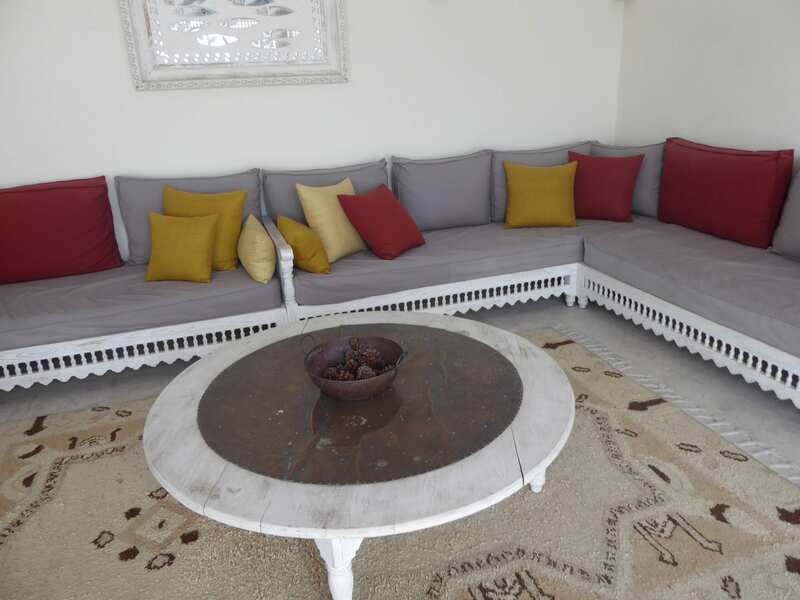 On the 3rd floor there’s a large room with seats and sofas, which is the perfect place to relax in any weather and temperature. 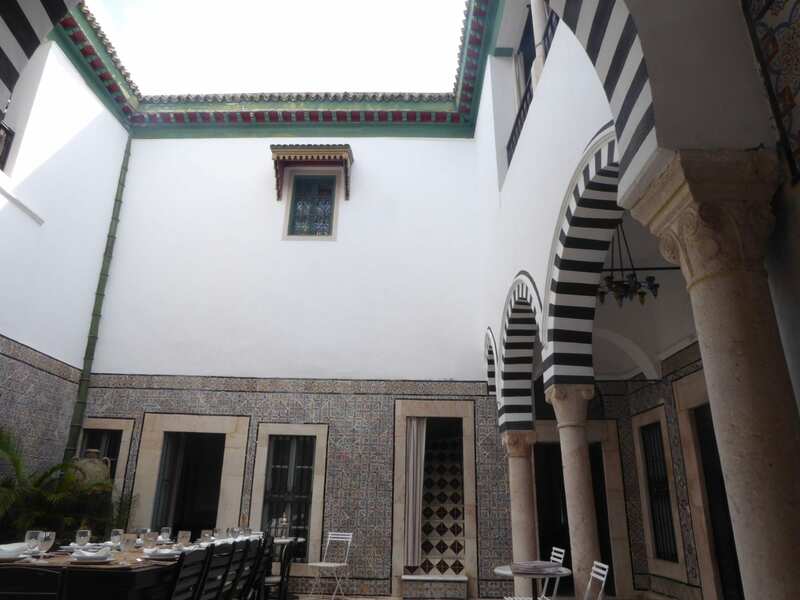 At the top is the roof level with chairs and tables, and great views of the Medina in every direction. The strange thing is, out on the streets all is noise and bustle, but in the house it’s completely peaceful! Leila works with the Community, introducing visitors to workshops, like book binding, cookery classes etc. It’s 15 minutes to the beach by car. 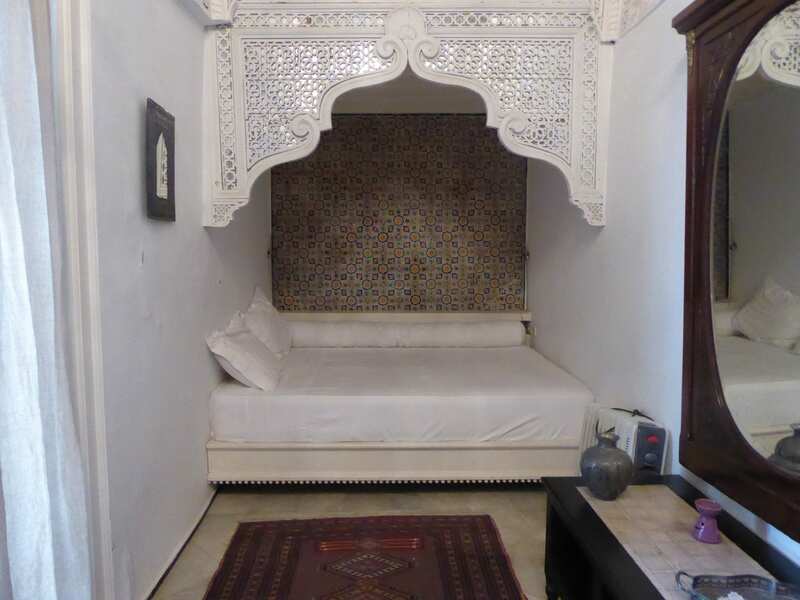 The average stay of her guests is 2-3 nights, and they’re 50% tourists and 50% business people. So far she’s had 58 different nationalities staying there! Lunch was served in the courtyard. 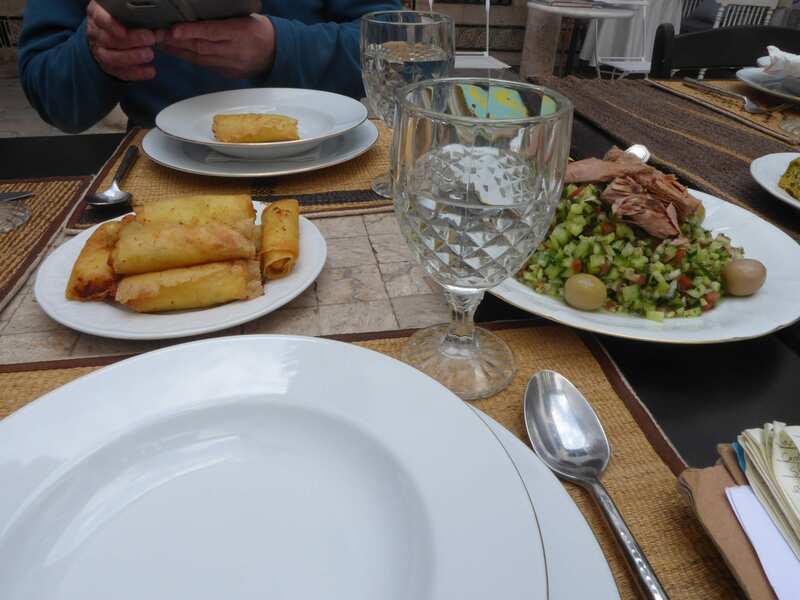 We had a selection of breads, soup, and brik, which is served in different variations with most Tunisian meals. 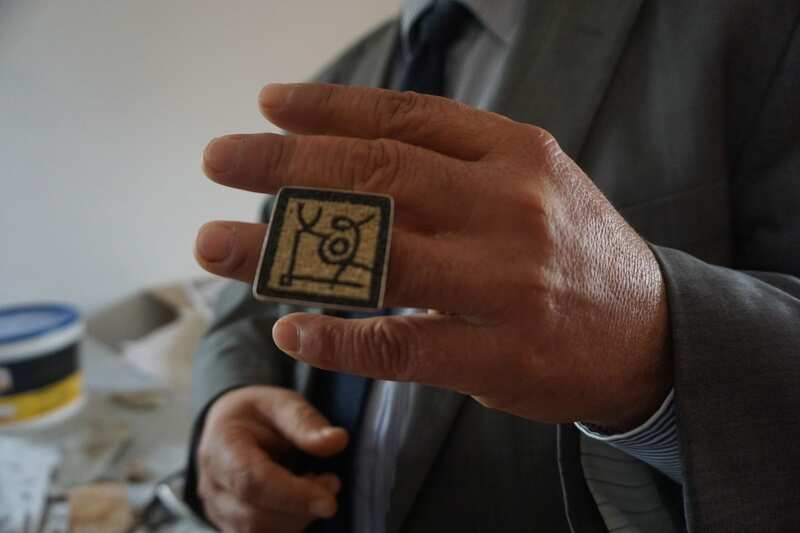 These were quite small and known as Fingers of Fatima. We also had squares like Spanish omelette. But these are called Tagines as they’re cooked in the traditional tagine. And there was a delicious salad, cut into tiny pieces with a distinctive aroma of mint. The main course followed. 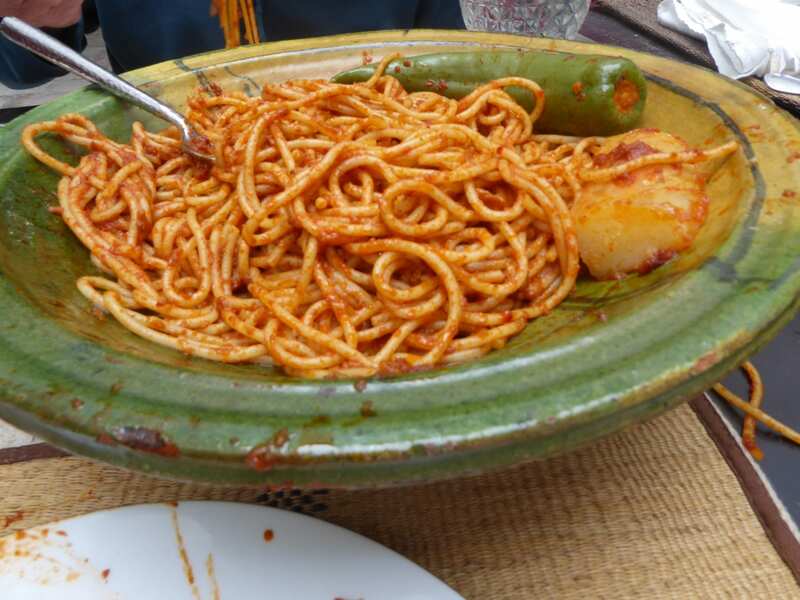 It was a spaghetti chicken dish. On top of the dish were some hot peppers and a fish which we were told was baby shark. Of course we sang that terrible song (Baby shark doodle-oodle-oodle-oo) and even the Germans knew it! Tunisians don’t have a dessert like we do. If anything, they serve a bowl of fresh fruit, and dates when they’re in season. We had to leave, so we said our goodbyes and walked through the Medina streets again. Carthage was next. The remaining ruins are on two sites. Most of the ancient city is buried under the modern city. It will never be seen again. It would have stretched right down to a port beside the sea. It was huge! 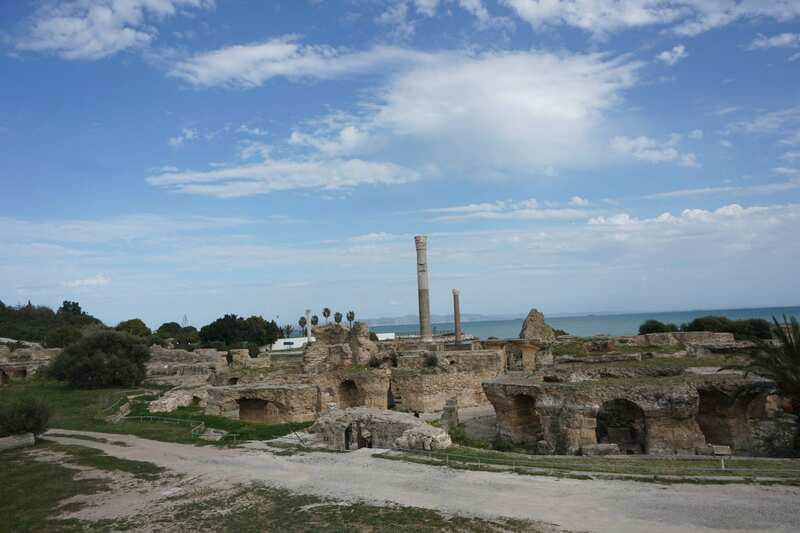 You can read about Carthage in many books and online. 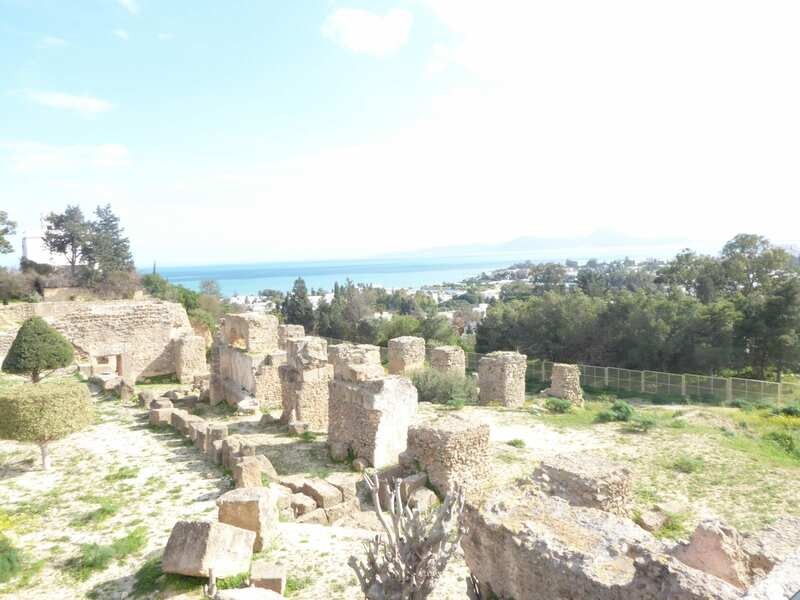 It was a Phoenician settlement that was eventually destroyed by the Romans in 146BC. We left through the exit and there were stalls lining both sides of the road. Coaches of tourists used to stop here regularly, but they’ve all stopped coming. The stalholders’ incomes have literally dried up. 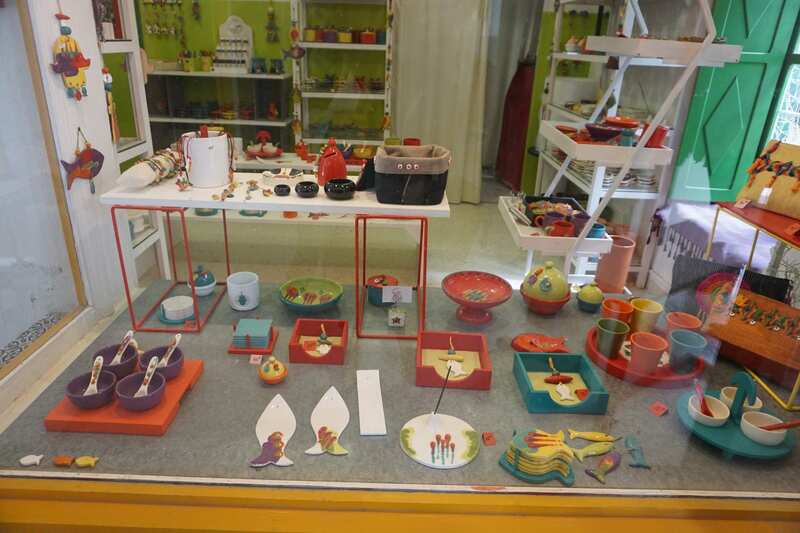 I bought some pottery at amazing low prices and they were grateful to have the trade. It was time to return to our hotel. It had been a very interesting and educational day.